With my boyfriend working for the Kentucky State Police and traveling all over the Bluegrass State, I've found myself focusing a lot of my reading and research on Kentucky legends and ghost stories. Through that research, I've stumbled upon not one, but TWO different Kentucky lake monster stories! Now, Kentucky definitely isn't a state that I would normally associate with a high concentration of aquatic cryptids...but these two stories certainly suggest something strange is going on in those waters! The first lake monster I ran across comes from the far western part of the state, in Rockcastle County. Close by to the haunted Aunt Polly House lies Lake Linville. 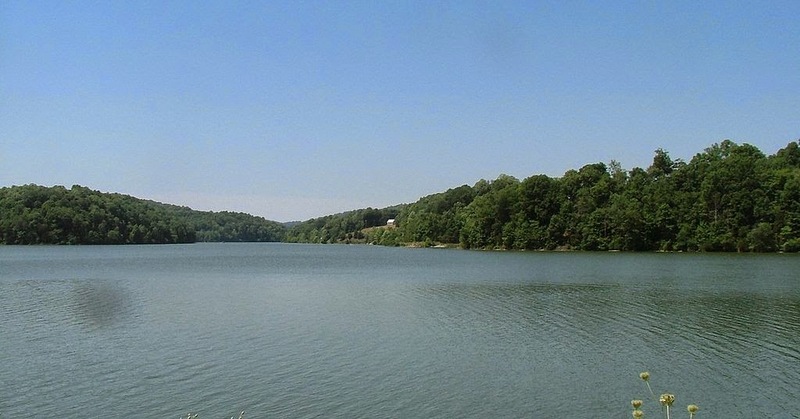 Lake Linville is a man-made lake created in 1968 by the construction of the earthen Renfro Dam. At a maximum depth of only 36 feet and an average depth of 16 feet, it doesn't necessarily seem like the ideal home for a large, unusual beast...but try telling that to the locals! "ONe afternoon, we decided to take a hike in the woods after our picnic and we had been gone for about an hour when we heard the helicopters. There were three of them and one was huge, the size of an Army helicoptor or something. We stayed in the woods and watched as men with guns got out. Mom was afraid and made us all hide. The next thing I knew, a large crate, big enough to hold a car was brought off of one of the helicopters. Then six men with guns who were wearing black masks opened it. I was astounded and almost screamed as a huge, black snail looking thing came out. It seemed to be looking at the men and one of the men yelled, "Go!" real loud and then the thing swished into the water. The men went back to the helicopter where two more crates were taken off and two more of the slug like animals were let go. All of a sudden the men with the guns began to back up and we saw that one of the giant snail like things was scooting towards them. That's when we heard the shots." This second lake monster tale only recently caught my attention while reading the book Gateway Ghosts and Other Local Legends by Lori and Ron Coffey. Sid Calk Lake, located in the Mt. 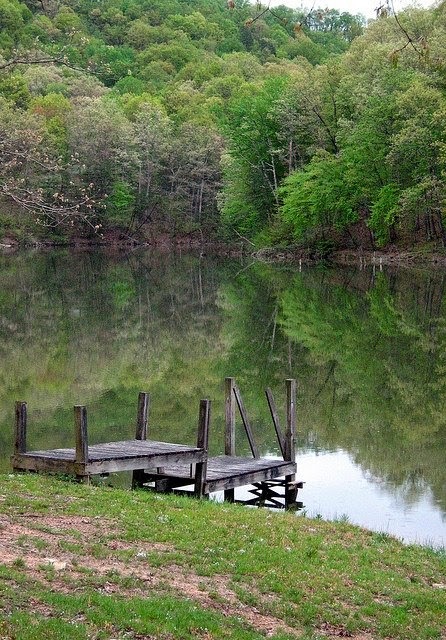 Sterling area, is a private fishing lake named for Sidney Johnson Calk, a local resident who died on October 16, 1975 at the age of 85. As a private lake, membership is required to partake in the excellent fishing, picnic opportunities, and corn hole tournaments! Today, the lake seems like a fun place to relax and partake in outdoor recreational activities, but it became a scene of horror during the summer of 1967. The first sighting of the Calk Lake monster was witnessed by three men out doing some night fishing. When their boat got caught on some debris, one of the men jumped out to help untangle it. He thought he was standing on a submersed log...until the 'log' coiled up, splashed around and swam away! The light of the full moon illuminated what was estimated to be a snake or snake-like creature as big as a telephone pole. Several days after that sighting another fisherman was thrilled to have caught a pretty big bass...but as he was reeling it in, a snake with a head as large as a trashcan snatched it off his line and swam away with it. The final sighting came later that summer when a young boy spotted the creature, describing it as being 'long as a house,' and as 'big around as a man.' A few glimpses were caught here and there, but just as mysteriously as it showed up, the Calk Lake Monster disappeared for good. I don't know about the "Men in Black" type story, but we have our own lake monster (in Seneca Lake, one of the upstate NY Finger Lakes) about an hour and a half from where we live, and there is another one in Lake Champlain. It truly makes you wonder - the old 'where there's smoke there's fire' saying. Hehe, yeah, I'm pretty dubious about that one! There do, however, seem to be no shortage of waterways throughout the US with strange sightings, though...which, if anything, make for some good campfire tales! Thank you for sharing your area's lake monsters, and thank you for visiting Theresa's Haunted History!